Dragon Springs Road, published this January, sets the bar very high for 2017’s Canadian literature. This second novel by Janie Chang is a unique, beautiful, human, and insightful novel. Set near Shanghai, China, in the early 20th century, Dragon Springs Road tells the story of Jialing, a little orphan girl of mixed-heritage: she is Eurasian. In her times, this meant shame and rejection. Racism was so strong that most Chinese as well as Europeans just winced in disgust at the sight of her. I was a tainted creature. I was zazhong. However, Jialing lives in extraordinary times. In the early 20th century, China is at a threshold. Western culture is putting a lot of pressure on the traditional ways of life in the Middle Kingdom. One of the best theme in Dragon Springs Roads is the depiction of this clash, how it completely and unexpectedly turned people’s fate around. It was a time of unthinkable opportunity and danger. As a hun xue—an Eurasian—and a poor orphan, Jialing is destined to a hard, degrading life. On the other hand, the daughters of her foster family are expected to live a comfortable existence. Now, a social revolution is shuffling their roles. If Jialing is underprivileged financially, she nonetheless has the freedom that other women, still trapped in the customs of traditional families, don’t have. I really enjoyed how the story followed several women of different backgrounds to show the various and somewhat contradictory effects of social changes. 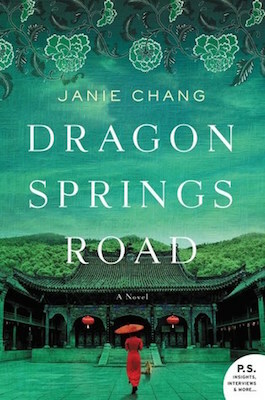 Dragon Springs Road critiques many aspects of the early 20th century Chinese society, from corruption to racism, to human trafficking and discrimination, including the apartheid-like rules instated by Western people. However, the book is particularly focused on the condition of women. In the wealthy family Jailing lives in, several women must share one husband. There is a silent rivalry between the women, craving attention and respect. The number of children they produce is what establishes each woman’s status. Access to education is denied and deemed “useless”. Worst, a woman was entirely at the mercy of her male guardian: “a leaf, blown around a courtyard at the behest of others” says Jialing. Daughters and wives could be trading goods: separated, sold and forced into prostitution by the mere decision of a father, husband or even elder brother. Daughters could be married as a small child, and couldn’t dream of having a career. On the bright side, Dragon Springs Road shows how this started to change. Jialing, as an orphan and relatively free from family duty, is in the best place to veer from customs and benefits from the cultural revolution taking place. However, my favourite aspect of Dragon Springs Road was its magical dimension. Jialing is guarded by a local fox spirit whom her mother worshipped. It seems that this fox spirit is representing the best in traditional China: its inherent beauty, its resilience and persistence, and its long history. Dragon Springs Road is often tragic but I found that the Fox brought hope, humanity, wonder and the most poetic passages of the book. It also gave perspective to the life of Jialing, as the Fox was many century-old and had a focus on very core values, such as love and loyalty. We’re an odd sort of spirit, not deity, not demon. Not human, not fox. Perhaps that’s why I like you, little hun xue. Neither of us is fully one thing or another. Featuring an insightful historical background and the poetry of magic, Dragon Springs Road is an incredible novel. Jialing is a strong, inspiring main character, and she keeps you riveted through her whole story. I was impressed at how every single detail and character was full of meaning, and how all elements seemed to neatly fit together in a perfect picture of 20th century Chinese society. I can’t say enough how much I loved the Fox, and the fairy tale atmosphere it brought to the book. A truly beautiful and powerful novel.